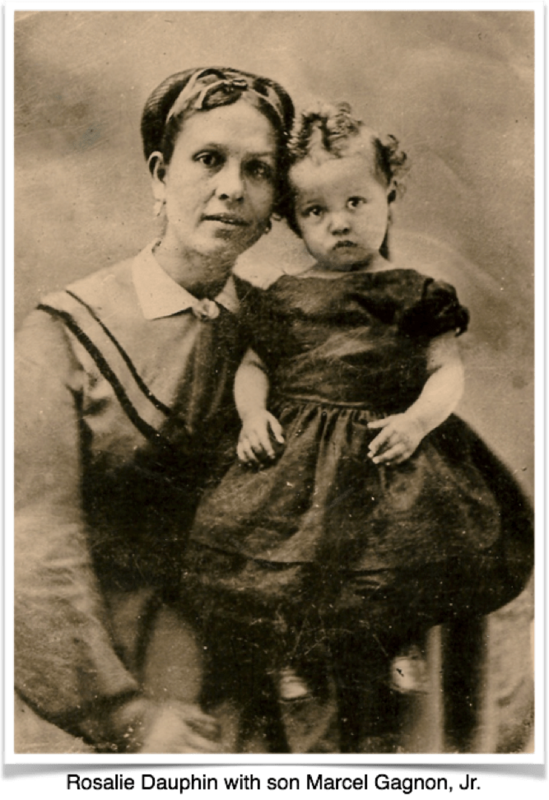 Rosalie was born to Suzanne Cayuse and Mathieu Dauphin in 1847 in California. Her birth record, like those of her siblings, is a key piece of evidence documenting the movements of her family in the 1840s and 1850s. In Frenchtown on February 25, 1864,at the age of 17, Rosalie married Marcel Gagnon (1831-1912), a prominent French-Canadian settler who had immigrated from Canada in 1850. Marcel had become a U.S. citizen in December 1849 in New York City before sailing with his brothers to participate in the California gold rush. Marcel left California by 1855 and homesteaded in Frenchtown, where at some point he met Rosalie, who was 16 years his junior. Rosalie and Marcel had seven children between 1864 and 1878. Rosalie and Marcel were strong supporters of the Catholic Church, donating land to Father J.B.A. Brouillet in April 1877 to build a new church and St. Rose Cemetery on the hill (at the current Frenchtown site) for the token amount of one dollar. This land was originally part of the Narcisse Raymond claim, but was purchased by Marcel Gagnon and Gilbert Giroux in 1864. Marcel built the original wooden cross to be blessed and erected at the site. Rosalie and Marcel’s children were baptized at the St. Rose Mission. Rosalie lived with her family in Frenchtown until her death on May 18, 1878. She died in childbirth along with her seventh child, a son named Benjamin. At the time of her death, she left behind six children ages 14, 12, 10, 7, 5, and 4. Rosalie and Benjamin were buried in St. Rose Cemetery. Her widower Marcel remarried on January 13, 1880, to Julia Raymond, 19 years old and thirty years his junior. Julia’s death date is not known. Marcel died on February 26, 1912. Several of Rosalie and Marcel’s children married into Frenchtown families, and most received allotments on the Umatilla reservation. 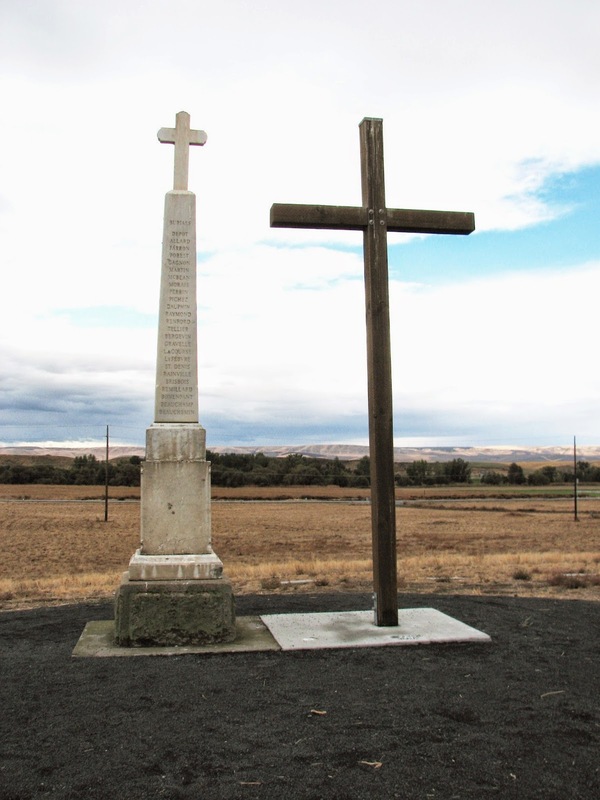 Harriet Duncan Munnick, Catholic Church Records of the Pacific Northwest: Walla Walla, Register II, Frenchtown, St. Patricks and St. Rose of Lima 1859-1872, P.23-24-25, M-3, Marcel Gagnon and Rosalie Dauphin. See Marcel Gagnon’s obituary from Waitsburg Times, March 1, 1912, found on http://mv.ancestry.com/viewer/19f86c28-0cae-4ce6-acac-29beb706174e/26191875/1816793199?_phsrc=RuG2&usePUBJs=true; see also Marcel’s declaration of intent to become a citizen, New York, December 13, 1849, found at http://mv.ancestry.com/viewer/757eaf5c-af65-4686-917a-46a89011014a/26191875/1816793199?_phsrc=RuG2&usePUBJs=true. 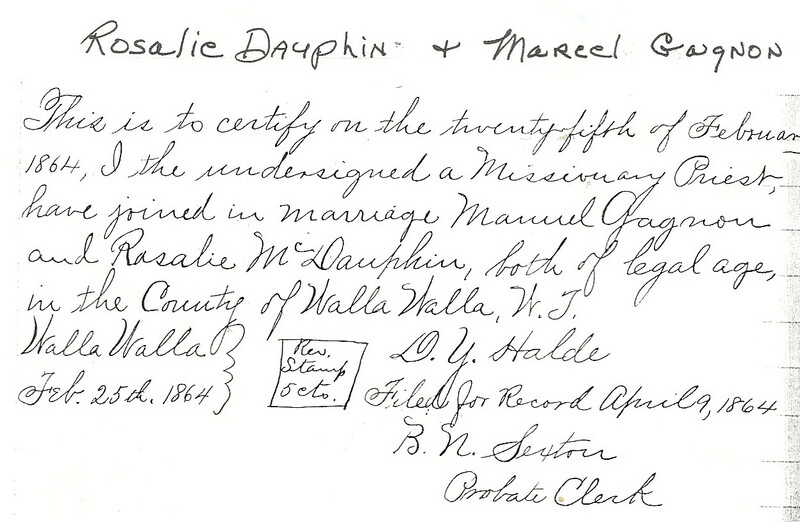 Frenchtown Historical Site, “Marcel Gagnon,” accessed August 2, 2016 http://www.frenchtownwa.org/marcel-gagnon/. Munnick, Catholic Church Records, Walla Walla 1859-1872, P.33-34-35, B-4, Lucien Gagnon (2/24/1865); P.48-49-50, B-43, Jeremie Gagnon (11/18/1866); P.69-70-71-72, B-37, Sophie Gagnon (11/29/1868); P.92-93-94-95, B-3, Celina Gagnon (2/19/1871); P.6-7-8, B-13, Rosalie Gagnon (3/20/1873); P.21-22-23, B-68, Peter Gagnon (10/11/1874). Harriet Duncan Munnick, Catholic Church Records of the Pacific Northwest: Missions of Frenchtown and St. Rose of Lima, 1876-1888, P.5-6-9, S-8, Rosalie Gagnon. The Munnick index indicates a “Gagnon son” who died on November 21, 1878. Washington, Marriage Records, 1865-2004, reference number eawwmcu899, accessed June 1, 2017, http://search.ancestry.com/cgi-bin/sse.dll?indiv=1&dbid=2378&h=2152022&ssrc=pt&tid=46035071&pid=6934452575&usePUB=true. Ancestry.com. Washington, Select Death Certificates, 1907-1960 [database on-line], FHL Film Number: 1992076, accessed June 1, 2017, http://search.ancestry.com/cgi-bin/sse.dll?indiv=1&dbid=60229&h=1781870&ssrc=pt&tid=46035071&pid=6934452575&usePUB=true.